Thank you for your interest in applying for admission to Richard Bland College of William & Mary. Candidates for admission must have graduated from an accredited high school with a standard or advanced diploma or have earned an equivalency certificate based on GED tests. Applicants are evaluated on the basis of high school courses, grades and extracurricular activities. High school work should normally include four (4) units of English, three (3) units of mathematics (preferred courses: Algebra I, Geometry, Algebra II or advanced math courses), two (2) units of history or government and two (2) units of science. Two (2) units of foreign language. are preferred but not required. Richard Bland College welcomes students who have been home-schooled. Home-schooled students must provide a transcript of all coursework completed. In addition, a home-schooled student must take the Scholastic Achievement Test (SAT). If the student successfully passes the GED, the student is eligible for admission to the College. A home-schooled student who desires to pursue a degree at Richard Bland College should be at least sixteen years of age prior to registration. In addition to the items noted above, home-schooled students must submit the Supplemental Home School Education Form. International students must obtain an F-1 Visa at a U.S. Embassy or Consulate in their country of origin. If you are transferring in from another college , please submit the Dean Certification Form. We do not guarantee that credits from Colleges and Universities outside of the United States will transfer. 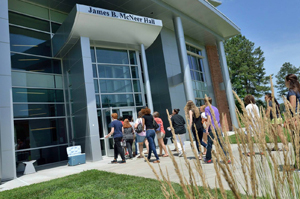 Richard Bland College offers a number of dual-enrollment classes for qualified high school juniors and seniors at several area high schools. Interested students should contact their guidance counselors to determine if courses are available at their respective schools. Credits for courses successfully completed may be used toward a degree at Richard Bland College or may be transferred to another college or university. Credits earned under this program will be officially recorded upon receipt of the certification of high school graduation. Students who plan to enter another institution after graduating from high school are advised to check with that institution concerning transfer of credits earned through the dual-enrollment program. Questions about this program should be directed to Enrollment Services. Richard Bland College of William & Mary (RBC) offers a High School College Program (HSCP) that provides additional learning opportunities for accelerated high school and home schooled students. Students may enroll in one to five college courses each semester during their junior and senior year and will receive college credit that can also satisfy requirements for the high school diploma. In order to enroll in the HSCP, students must have a cumulative grade point average of 3.0 on a 4.0 scale, and have received approval from the appropriate high school official (in the case of home schooled students, the parent who administers the home education). The student must complete the attached High School College Program Approval Form, the High School College Program Registration Form, the Richard Bland College In-State Tuition Application, and submit this to their high school’s School Counseling or Guidance department. The high school will send the student’s completed HSCP forms, and official high school transcripts to: Richard Bland College, Admissions Office, 11301 Johnson Road, South Prince George, Va 23805. HSCP students will be contacted by Student Success Center for information on course registration. HSCP students will be responsible for their tuition and will be charged at the same rate as commuter students. Textbook prices vary and will also be the responsibility of the student. No financial assistance is available for HSCP students. Please direct all questions to the Enrollment Services (Admissions) Office at 804-862-6249.